Back pain is one of the most common ailments plaguing Americans today. Hours of sitting and standing all day wreaks havoc on the back and can even cause problems like sciatica or pinched nerves. Most people are dealing with it as best they can by going to chiropractors and physical therapists. But what if I told you there’s an easy way to reverse the damage of gravity on your back? I’m talking about inversion therapy. It has been hailed by many as a tried and true way to relieve back pain. Even science has backed inversion therapy as legitimate. 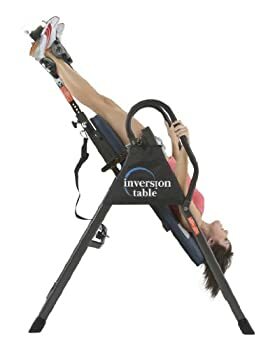 If you’re tired of having a bad back, stick around and check out our inversion table reviews that could change your life for the better. Why do People Have Lower Back & Spine Pain? Do Inversion Tables Work for Back Pain Relief? Who Should Not Use an Inversion Table? IRONMAN Gravity 4000 350 lbs. As common as back pain is, do you know what causes it? Out of all the pain in the back, the lower back experiences the most discomfort (source). This is a natural effect of gravity on the body as it pulls down on the back over time, compressing vertebrae and sensitive discs in the spine. This, in turn, can cause uncomfortable pressure on the nerves. The five vertebrae in the lumbar area of the back holds most of the weight of the upper body. Over time these become weakened and lead to greater susceptibility for injury. Many of these injuries include sprains and strains related to lifting heavy objects, overstretching, and tearing of muscles and tendons. With age, adults experience intervertebral disc degeneration (source). This is when the intervertebral discs in the spine, which act as shock absorbers and cushioning against nerves, begin to lose fluidity, flexibility, and integrity. Bones also lose their strength, leading to conditions like osteoporosis. Fitness level. Those who do not exercise regularly have weaker back and abdominal muscles. A stronger body helps delay the degeneration of bones, discs, muscles. Occupation. Those with jobs in labor fields find themselves lifting and carrying heavy items. Excess stress on the back is apparent here. Even without all these risk factors, most people will experience back pain at some point in their life. It is the natural consequence of a spine working against gravity to remain upright. So, why don’t we use gravity to reverse the damage that it’s caused! One can see the benefits of inversion therapy by that explanation already. Pressure is released from the sensitive nerves in the back and allows for space between the discs and vertebrae. Many claim immediate relief their first time inverting. Inversion therapy must be done repeatedly and often (2-3 times/day) to be able to reap consistent benefits. This helps to counteract the effects of gravity on the spine and back on a regular basis. An inversion table is used to do inversion therapy on. The user’s ankles are strapped in usually with foam rollers or a cushioning system that’s locked in using a latch mechanism. The user then lays back on the backboard to slowly begin to invert themselves back. Inversion tables usually have the option of inverting different degrees. Most also allow the user to fully invert to 180 degrees, giving maximum relief to the spine. Let’s talk about how to use an inversion table. First-time users will want to make sure they have a friend to spot them just in case things go awry. Being upside down, hanging from your ankles is a weird feeling. First-time users should also start off slow at the lowest angle (20) and only for about 30-seconds to a minute. Steadily increase your time and inversion angle over weeks. Soon you’ll be comfortably fully inverted for 5 minutes at a time, no problem. Now you know how an inversion table works. We must ask, does an inversion table work? Are inversion tables good for your back? Don’t worry. I’m getting there. Those who do inversion therapy have sworn by the method since they’ve started. Not only that, its research has shown positive benefits and evidence for true relief of back pain through inversion therapy. This isn’t just “alternative medicine” mumbo jumbo. Inversion therapy really works. The most obvious of benefits is the relief of pressure off those sensitive areas of your back. Gravity has been causing the bones, discs, and nerves in your lower back to slowly begin to weigh down on each other. Additional heavy lifting, overstretching or sitting and standing for too long exacerbates the problem, and you end up with a weak and painful lower back. Hanging from the ankles and inverting allows gravity to pull your spine the opposite direction. Your back experiences relief as space is created between the bones, discs, and nerves. It also stretches and elongates the muscles. Relating to the previous benefit, increased space between the vertebrae of the spine means a greater range of motion in the back. Gravity causes the spaces in the lower back to sink down into each other, and then get stuck there. Once inverted, those vertebrae are separated from those spaces in which they didn’t belong. You’ll be able to reach farther than you have in a long time! This elongating of the spine also helps to counteract the effects of height “shrinkage” due to gravity over time. We spend a lot of time sitting during the day. For many of us, sitting comfortably means slouching. Sitting upright takes a lot of effort, and we’re not actively thinking about our posture as we sit at work or watch television. But this creates bad problems for our backs. Our lower backs take the brunt of our weight whenever we slouch. Inversion tables keep our backs at proper alignment, and by lengthening the spine, takes pressure off the lower back. During regular workouts, spines can also incur minor misalignments due to over-exertion and contortion. Inversion therapy easily corrects these minor misalignments. Blood flow usually works against the force of gravity to pump blood throughout our bodies. By being upside-down, gravity can assist our circulatory system. This also helps the lymphatic system clear easier and faster, reducing aches and pains of stiff muscles. As you’re inverted, increased flow of oxygen enters the brain, increasing mental alertness and thus cognitive performance. When your body is not stressed out, neither is your mind. The absence of aches and pains is often taken for granted. But when you’ve been dealing with an aching back for a while, a non-achy back truly does make you grateful for something like inversion therapy. The cleansing and therapeutic effects of inversion therapy help to relieve tension in the body so that you can be focused on your goals. With all these benefits of inversion table, it’s clear that regularly engaging in inversion therapy can help relieve back pain. As pressure is taken off the lower back, users of inversion tables feel immediate relief the first time they invert. With continuous use, users can subvert the effects of gravity on a daily basis. For this reason, inversion tables are usually used 2-3 times a day for 3-5 minutes each session. This helps to relieve pressure off the spine and lower back consistently without gravity pulling back down on the lower back and spine. I could go on a lot more about inversion therapy, inversion tables, and their incredible benefits, but I think you get the idea. You’re about ready to buy yourself one, am I right? So, what is the best inversion table? 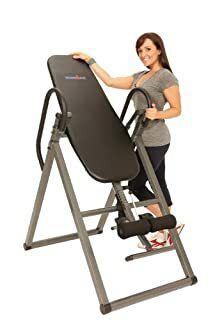 I’ve sifted through to find the best rated inversion tables to relieve back pain. Let’s begin our look at the top inversion tables to get you mobile and pain-free. 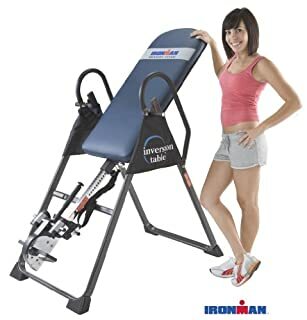 The best home inversion table is the IRONMAN Gravity 4000. This table is user-friendly and sturdily built to give you comfort and ease of mind as you hang upside down. The frame is made of sturdy steel. A powder-coated finish keeps the frame from eroding while giving it a nice shiny finish. The bottom of the frame is stabilized with rubber non-skid floor stabilizers to ensure security on any surface. The backrest is lined with memory-foam nylon which users will find very comfortable. Extra-long safety handles are also covered with foam for a soft grip. The handles were made extra-long for ease of access while inverted. How does this equipment do with inverting? Ergonomically molded ankle cushions fit comfortably around the ankles. This is a feature only few therapy tables have; others simply have foam rollers, which can dig into the front of the ankles uncomfortably. There is also a quick-release ratchet pull system, which safely and securely locks ankles into place without the need to bend forward. A safety pull strap adjusts to 3 starting inversion adjustments at 20, 40, and 60 degrees. You are also given the ability to fully invert at 180 degrees for maximum inversion. The safety strap ensures that you will be secure as you hang upside down. This table accommodates heights of 4’9 up to 6’6. This table is the most sturdy and heavy-duty with a max user weight of 350 lbs. You can feel safe and secure on this inversion table. Most will find they can assemble this piece of equipment in under an hour. Although this equipment does have a folding capability, most users will probably want to find a consistent home for it as it is heavy and difficult to move. You’ll probably be using it often enough that you won’t want to move it anyways. This table is available at a great low price. You’ll be getting the most value out of your dollars by choosing this best inversion table for back pain. 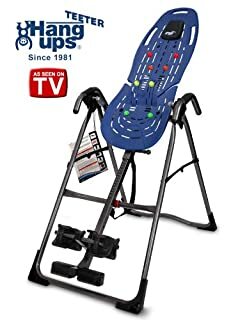 This inversion table from Innova is not as heavy duty as the previous IRONMAN Gravity 4000, but still packs a punch with a weight capacity of up to 300 lbs. This table has many other features that make this a solid table for anyone looking to do inversion therapy. The extra-long and wide backrest is large enough to fit most frames and is comfortably padded. There is also an adjustable headrest pad for neck and head comfort. A protective cover layers the backrest to keep germs at bay. Innova made this table with their True Balance system to make inverting easy and safe for everyone. The heavy gauge steel tubing supports the table, ensuring no wobbling or shaking as you invert. The backrest moves to five inversion angles, so beginners have plenty to work with. Adjusting is easy between angles. Ankle cushions have been ergonomically molded for a soft form fit around your ankles. Thick foam rollers keep your feet in place. Some users find that the roller could be a bit more comfortable. Users are recommended to wear shoes while inverting on this equipment to lessen the discomfort on the feet. Soft-touch foam handlebars act as a safety net to pull you back upright when done inverting. This equipment is easy to assemble within an hour. Instructions are understandable and helpful. Like the previous IRONMAN model, this model does have a folding capability, but I think most users will not need to use this feature. A great selling point of this equipment is its affordability, even lower than the previous IRONMAN therapy table. 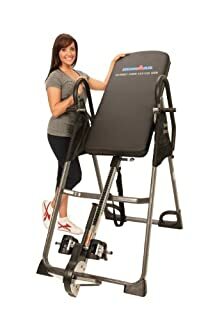 This is a quality inversion table that can help you lower your back pain without breaking the bank. They’ve made the frame as durable as possible with heat-treated steel, specialized pivot bearings, and auto-locking hinges. This sturdy base keeps users secure whether inverted or not. Pre-set rotation options are marked at 20, 40, and 60 degrees. 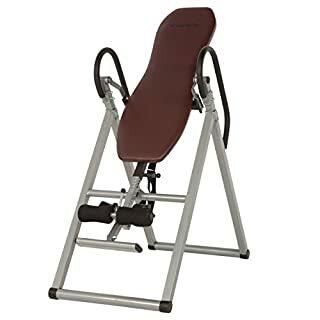 At 180 degrees, the backrest locks securely in place making it possible for users to engage in abdominal inversion table exercises while fully inverted. Grips located at the bottom of the equipment are easily accessible while inverted allowing for more stretching capabilities. Bonus accessories of acupressure nodes and lumbar bridge can be used to get even more back relief. Teeter really pulled out all the stops for this one. The ankle straps keep the ankles securely in place, and an adjustable foot platform accommodates different size feet. Although I like this accommodating feature, I think it would’ve been better if they had put their efforts into a secure-latch lever. Users must bend down to secure their ankles, making this table not ideally suited for those with painful lower backs. Other than this oversight, this Teeter is a great gravity inversion table able to hold up to 300 lbs. and heights of 4’8 to 6’6. A CD is included to help you assemble the equipment, which many users will find helpful. All these features culminate into a pretty pricey piece of equipment, but with all the quality features, I think many users may find it worth it. 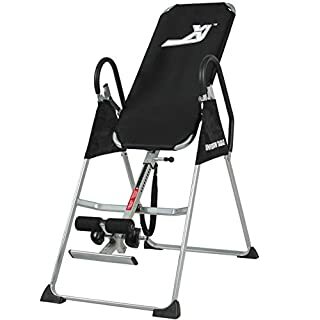 If you have no need for all the bells and whistles of an inversion table like Teeter’s, you’ll be happy with this inversion table from Exerpeutic. At its low price, you’ll be getting quality equipment with everything you need for a productive therapy session. 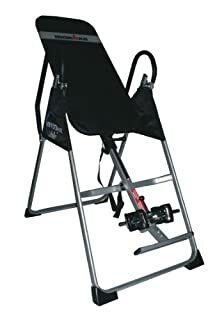 This inversion table is incredibly sturdy and durable. This is thanks to the 1.5-inch square steel frame. This table is well constructed and easily assembled under an hour. It accommodates users between 4’10 and 6’6 and up to 300 lbs. A heavy-duty table like this will not be easily transportable, so make sure to build it where it’ll remain. Users will enjoy the foam backrest and extra-long foam handlebars. Need more foam? The ankle holders are also foam, although not ergonomically molded. Some users may find this uncomfortable. Although the ankle holders could be more comfortable, there is a short lever to secure them in place. Unlike the Teeter model, Exerpeutic made sure users of this table wouldn’t have to bend over too much to secure themselves in. An adjustable tether strap gives users the ability to choose their inversion angle. This table does also go to a totally inverted 180 degrees safely. 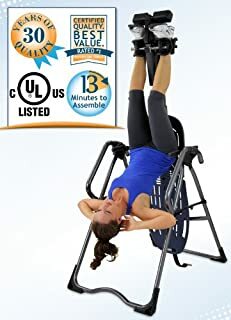 An inversion table of this quality is hard to come by at such a decent price. Both your back and your bank will thank you. IRONMAN’s Gravity 3000 Inversion Table is made with a tubular steel frame that’s able to hold up to 350 lbs. Nonskid rubber floor stabilizers keep the equipment steady on the ground while in use. The backrest is made with memory foam for a nice cushion. The ankle holders are also ergonomically molded to fit perfectly around your feet. Extra-long handles allow for safe return to non-inversion. An easy-latch lever locks the ankles in place easily without the need for excessive bending over and reaching. You’ll be able to easily adjust the safety tether strap to get the inversion angle that you want, all the way up to full inversion. While inverted, make use of the HandleGrip handlebars at the bottom to get an added stretch. I love this feature since you can get more out of your inversion table than simply turning upside-down. Instructions on assembling this inversion table are straightforward and understandable. Most users will have it assembled within an hour. You’ll want to make sure to assemble it where it will be staying, as it isn’t the lightest of inversion tables. This equipment is durable, heavy-duty and able to handle the heaviest of users. The scratch-resistant powder-coat finish makes this a nice piece of equipment to have in any home. It’ll most likely be your favorite too as it helps to relieve your back pain. FIR heat therapy seems to enhance the natural effects of inversion therapy. It helps to increase blood circulation and bodily energy, decrease stress levels, and relax muscles. Since all the benefits are the same as using an inversion table without, some users may wonder if the FIR heat is even necessary. I would say, probably not, but it probably feels nice. Whether you think it necessary, you’ll be able to control its activity with a remote control and LED display. Otherwise, using this as a regular stable inversion table works just as well as the last model described. IRONMAN is on a roll with their Gravity line. This Gravity 1000 inversion table has the key features of a good, basic inversion table. Strong tubular steel frame holds up to 300 lbs. on the nylon covered backrest. Ankle cushions are shaped to fit the compliment the ankles and are strapped in with a short ankle lever, which requires a little reach but not much. Inversion angles are adjusted using the safety tether strap. If you’re planning on using the folding capability, make sure to have a screwdriver close at hand. You’ll have to undo some screws to fold it and put it away. Otherwise, I say, just leave it out and use it often. 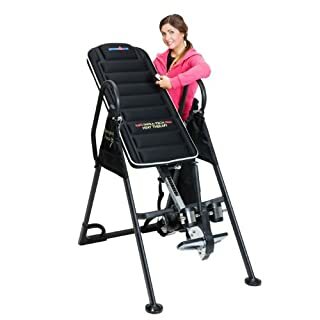 This inversion table from Teeter features heat-treated steel, an extended handle for securing ankles, and inverted handlebars for added stretching capability. The backrest of Teeter products flexes with the user while remaining sturdy. A CD is provided to help users assemble the equipment. Once assembled, users will be able to invert at angles of 20, 40, 60 or full inversion. If you know Teeter, you know their products are of top quality, as well as top price. This IRONMAN inversion table is a bit less durable than the rest, clocking in at a max user weight of 275 lbs. Even so, this table gets the job done for an affordable price. The tether strap is adjustable to different inversion angles. The handlebars are soft with foam and extra-long for security. The backrest is well padded to accommodate all aching backs. The one thing I’d wish to change on this inversion table are the foam rollers. Although there are contoured molded ankle cushions, the foam rollers are not the most comfortable on the feet. The ankle strap lever could also be a little longer to prevent bending over. These are all minor details considering the quality and value of this equipment. Lastly, this inversion table gives decent quality for a steal of a price. The steel frame on this guy can hold a weight limit of up to 300 lbs. and users between 4’10 and 6’6. You get extra-long handlebars, 3 inversion angle positions as well as full inversion, and removable nylon pads. The ankle cushions are regular foam rollers so you may experience some discomfort. There is no easy-reach lever to strap the ankles in so this is more suited for those who are able to bend over. As therapeutic and helpful as inversion therapy is, some people will place themselves at higher risk of injury by engaging in it. You should avoid inversion therapy if you have any of the following. High blood pressure, hypertension, or taking blood thinners. Inverting increases blood circulation, which in turn increases blood pressure. Avoid inverting if your BP is already high. Inner ear problems, glaucoma, or retinal detachment. Pressure increases around your eyes and ears while inverted making conditions like glaucoma worse. Heart condition, fracture, osteoporosis, hernia, overweight, or pregnant. These are all conditions that can only be worsened by inversion therapy. Talk with your doctor about whether inversion therapy may be right for you. They will be able to gauge which conditions may rule inversion therapy out, and prescribe a different treatment to ail your back pain. Safety. Bottom line – inverting is helpful, but can be dangerous if done incorrectly! We’re not used to hanging from our ankles with the most sensitive part of our bodies- our heads- closest to the ground. Safety is the top priority of any inversion table you consider. The equipment should be well-constructed with a sturdy frame material. Safety tether straps should hold you securely at the desired angle with no wobbling or unsteadiness. Handlebars should be easily accessible and long enough so any user can reach. Ankle strapping system should be secure without cutting circulation off. Comfort. Safety and security don’t have to mean discomfort. Quite the opposite, many inversion tables come with foam-covered everything: handlebars, ankle cushions, and backrests. Some backrests are lined with memory foam; others allow for more sturdy flexibility. Ergonomically molded ankle cushions make hanging from the ankles not as painful as foam rollers. Whatever your preference, your inversion therapy session should be comfortable and relaxing. Make sure your equipment can create that comfortable experience for you. Frame, Durability. Steel is the most common material used as the base of not just inversion tables, but most exercise equipment. It doesn’t erode and is extremely strong. The material isn’t the only thing that matters, though; the way that the steel is used to form the stable base is important as well. You probably saw the “tubular frame” feature in a lot of the inversion tables mentioned earlier. You’ll also see things like heat-treatment on the frame. Look for these to ensure a stable and durable frame. Ease of Use. How easy is the equipment to use? Do you have to bend down all the way to your ankles to strap yourself in, throwing your back out in the process? Are there handlebars that are easily reached on both sides for when you need to get out of an inverted position? Would you be able to use this equipment by yourself eventually? Are any added features/accessories straightforward and helpful? These are all things to think about so that you’re not struggling using your inversion table. Storage Space & Portability. As mentioned earlier, inversion tables are heavy. They’re meant to be- this helps keep them stable when in use, and usually means a reliable piece of equipment. But this does not make inversion tables easy to transport or store away. Most people will find that they use inversion tables often enough that they don’t want to store it away, so they’ll find a spot for it to stay. If you plan to invert only once a day and need to store it, look for a table with folding capability. Height and Weight capacity. Make sure the inversion table will be able to fit you properly. Most inversion tables will state the minimum-to-max heights it’s able to fit, and weight. Weight capacity is also a good indicator of how stable and durable the table is. Price. Think about your budget. Don’t worry about losing out on quality when looking for a lower-priced inversion table. As we saw from the list, there are many inversion tables that are of great quality for a low price. Higher priced inversion tables may not necessarily mean higher quality; many are priced higher simply due to the brand name. Warranty. For any equipment that you’ll be investing in for hopefully years to come, you’ll want to check out the warranty. Is there a warranty on the frame, parts, and labor? How long is the warranty for? Inversion tables are fairly simple equipment that isn’t heavily used (like, say, an exercise bike). Having a warranty can mean peace of mind just in case the equipment breaks down and needs maintenance. Bet you never even considered something like a back-stretching machine before this. Now you can’t imagine how you went so long without one! With proven benefits in health, well-being, and most of all, back relief, anyone can find a use for an inversion table. A good inversion table is not out of reach, especially with an article like this where inversion table reviews are spelled out for you. I hope you’ve found a table that fits your needs and budget so that you can get to immediate back relief. There’s no time to waste. Here’s to a happier, healthier back and life.